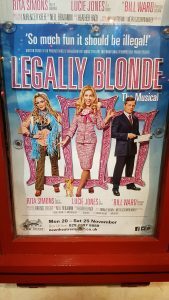 Legally Blonde is another of the ‘musical based on a film’ sub genre that have sprung up over the last few years. Or is it, when doing my “due diligence” on this review I see it’s actually based on a novel by Amanda Brown, which the film was subsequently based on. Although the popularity of the film no doubt helped when deciding to put on the show. I first heard of this show when it ran at the Savoy Theatre in London starring Sheridan Smith. I didn’t get chance to see it then, so when it came to my local theatre and starring a Welsh lead I was there! 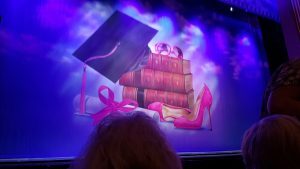 Legally Blonde is (for the 2017/18 tour) directed and choreographed by Anthony Williams, starring Rita Simons (EastEnders) as Paulette, Bill Ward (Coronation Street) as Professor Callahan and Lucie Jones (Rent, We Will Rock You, Eurovision Song contest) as Elle Woods. Now this show is … PINK! Very VERY PINK! But, as a guilty pleasure I must admit to loving the movies so I knew what to expect from the story, but not anything about the music, as with the exception of “So Much Better” which I’d seen clips on YouTube of Sheridan Smith singing, I had no idea what the music was like. Well I was pleasantly surprised, there are some great feel good songs in the show, stand outs for me included: “Serious”, “Ireland”, “Bend and Snap”, and of course “So Much Better”. Now to the cast, Lucie is brilliant, I mean I’d seen her in the tour of Rent and was blown away, so I knew the girl had pipes, but her comedic timing was excellent too. Rita Simons (as in the spirit of full disclosure I should say I’m a non-Eastenders viewer) was a revelation too, the supporting cast were excellent, deserving of a mention were: David Barrett as ‘Emmett’ and the actor who played ‘The Pool boy’ now sadly I am writing this review a few months after seeing the show, and the website only shows leading cast, so I can’t give him a name check. Suffice to say he was very funny. The only let down for me, and it appears some other reviewers, was Bill Ward, as I mentioned I don’t watch soaps, so had never heard of him, but he ‘talk-sang’ the first number, tried singing some of the later ones with varying degrees of success and his accent was all over the place. Now I can’t sing, and almost never post negative reviews, usually as I’m lucky enough not to see bad performances. However In this case I think it could be a case of the dreaded ‘stunt casting’ a celeb name to bring in the punters, a shame really as there are so many professional musical theatre performers who could have played the role so much better.